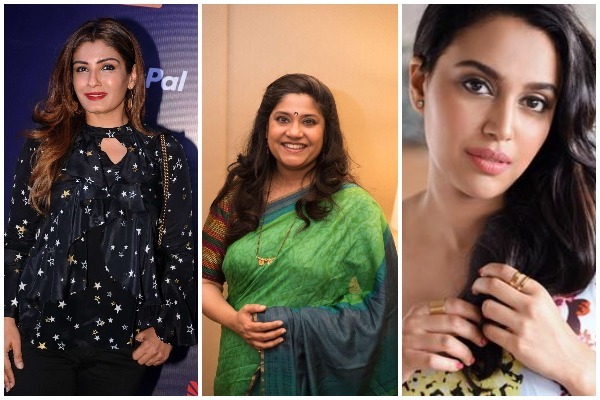 Renuka Shahane, Raveena Tandon, Swara Bhaskar and a team of lawyers and Psychologists as members of CINTAA committee to tackle sexual harassment in the film industry. Since Tanushree Dutta blew the whistle against Nana Patekar alleging him of sexual harassment, the #MeToo movement has taken Bollywood industry by storm. Victims of sexual harassment are revealing their #MeToo stories against biggest celebrities names, who once were praised, or I must say falsely praised. On Wednesday, Cine and TV Artists Association released a statement saying that a separate committee will set to handle the ongoing sexual harassment cases of industry. Sushant Singh, general secretary of CINTAA said the organisation is collaborating with several people to eliminate the issue. Swara Bhaskar is one among the member to be part of CINTAA committee who was already working on such matters independently and systematically. “Swara Bhasker approached us, she is a member. She was working on this issue independently, very methodically. When we met her we realised we were on the same page. We are planning to set up a sub-committee which will focus on sexual harassment awareness. It includes Swara and lawyer Vrinda Grover who will take a session for the industry. PoSH will also pitch in and counselling sessions, awareness workshops and symposiums will be held,” Singh said. Actor Renuka Shahane, Raveena Tandon, filmmaker Amol Gupte, journalist Bharti Dubey, PoSH (Prevention of Sexual Harassment) lawyers and psychologists will also be part of the committee. Raveena Tandon’s Tweets On Sexual Harassment Hints At Ex-Akshay Kumar And Twinkle Khanna? The objective of the committee is to take immediate action against the offenders and make Bollywood industry a safe place to work. “We need to define punishment for what one has done. As a trade union, we can only expel such people from associations. But as an industry, we need to think. The committee should be so strong that if someone is held guilty, proven wrong or is a repeat offender, no one should employ them. We will be coordinating with producers, because they are the employers. We need to create such an atmosphere,” Singh said. After all the dirty deeds of Bollywood is coming out revealing shocking names of the industry, CINTAA’s this step is most welcome and the ways things functioning needs change.